When a student in her class made fun of her older brother, who has autism, one 6-year-old couldn't stand idly by. Instead, she wrote a letter to the school, requesting that students learn about invisible disabilities. Lex Camilleri took that letter to the school's student council and later read it aloud to her class before having a discussion about autism and what it means. Lex's mother, Sophie, was informed of the letter by a teacher who approached her after school. That's when she posted it to Facebook and the handwritten letter quickly went viral. In the note, Camilleri wrote: "On Monday I felt very sad because a girl in my class said that my brother was weird. My brother has autism and is not weird. I would like it if we could learn about all disabilities in schools so that everybody understands that some people are different, but we should all be treated the same." British mother of three Sophie Camilleri, 44, said she's "so proud" of the way her daughter handled the situation. "Frank is older than her and that's all she's ever known," the mother told ABC News. 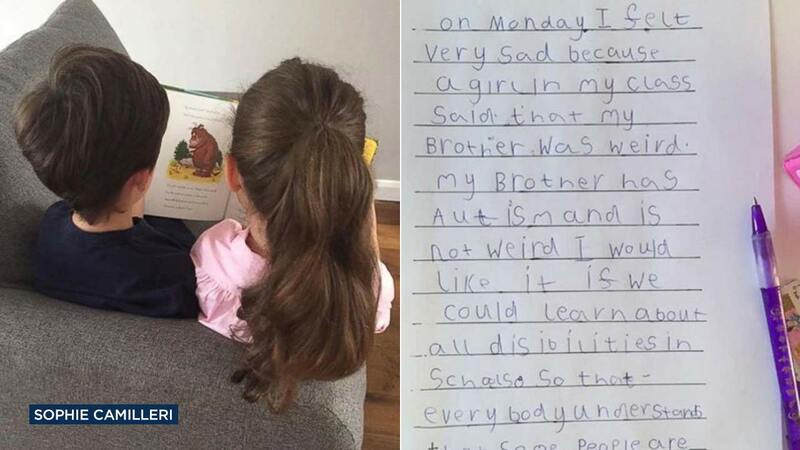 "She's only known autism so she doesn't see it as different. She's lived and breathed in from the beginning. That's just how it is." Camilleri recalled that a teacher described what happened after Lex read her letter aloud. The teacher asked the students if anyone knew what autism was and "not one child knew what it was. This is why she wants it out there and taught more in schools." The family hopes to take their request all the way up to their member of Parliament to see if it can be taught in schools country wide. "We need to educate children, as young as nursery, to discuss disabilities that aren't so visible like autism, dyslexia and people that may have a hearing impediment just so that children are aware and so children can understand it," Sophie Camilleri added. Lisa Goring, the chief programming and marketing officer at autism advocacy organization Autism Speaks, told ABC News in a statement that increased understanding of autism is needed in U.S. schools. "With an estimated 1 in 68 [U.S.] children diagnosed with autism, the need for acceptance and understanding for people with autism is vital," the statement read. "Many schools do provide information about autism, but we know that this is not done in all schools. To further the acceptance and understanding, Autism Speaks provides a School Community Tool Kit to help those in the school community support students with autism. We also have a tool kit specifically for elementary school children to learn more about autism."